Completed 1958 as Amastra for STUK. The Amastra mined and sunk in the harbour of Nhatrang Vietnam in 1967. Later repaired. 30-4-1985 arrived Chittagong for scrap. 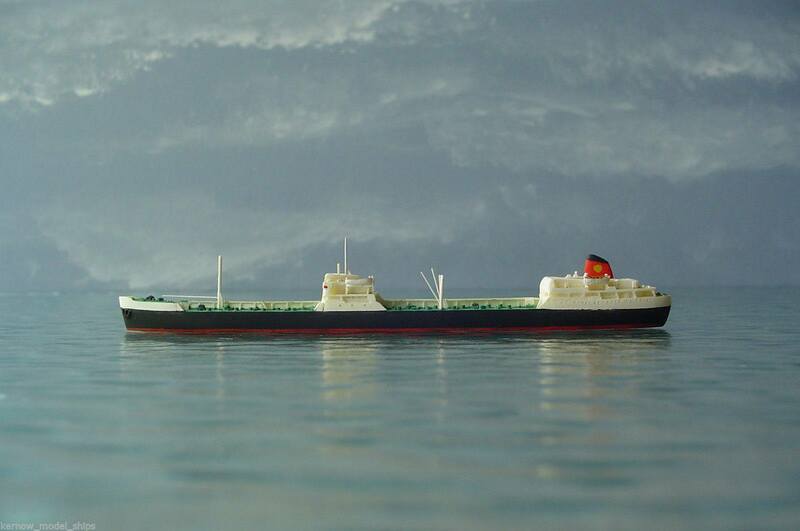 I was on the Amastra from 1971 to 1972 as Senior Ordinary Seaman. I sailed with a great Master called D McRenton, a great Captain. I enjoyed my time on her. I joined the Amastra March 1963 Sunderland dry dock 8 months later paid off in Kiel. I was 1st trip deck boy. 1st stop was Puerta Miranda (Venezuela) then La Spezia (Italy) then back to Venezuela, then Buenes Aires, then Venezuela, then La Spezia, then Malta, Cyprus. Thru the Suez to Bandar Mashur (Iran) then Dar es Salaam (Tanganyika)then Mombasa(Kenya) back to Iran then Bombay, Madras & Budge Budge, back to Iran (Abadan). Bombay Madras & Budge Budge again then back to Iran. Got orders for Turku (Finland) via Kiel canal; returned to KIEL and paid off. Prior to this trip, the furthest I had been was Southend on mud! Wont mention the delights of tank cleaning, maybe another time. 1980 saw my third trip on the Amastra and I have to say this ship brings back some of my favourite memories. Don Joughin was the Chief Eng and (Fleetwood) Jack Atkinson the old man plus a whole rake of other memorable characters. We were drifting off Curacao waiting to go alongside as ita? ?s too deep to anchor. I was topping off my pay off bronzie before going on watch at midday. I happened to glimpse over the coaming of the aft accommodation to notice we had drifted close to the Avila Beach Hotel where tourists where gathering to look at us. I then took a peep through the engine room skylight to see the engine was still at rest; however the Chief wasna? ?t, as he was making full speed down the Engine room ladders without touching the steps. I considered it appropriate to slip into a boiler suit and head for the engine room. On arrival I was confronted with the telegraph set at full astern, the engine stopped and no engineers to be seen with the exception of very red faced chief bellowing unrepeatable instructions from the boiler room door. The gist was - start the engine. This I did & we gracefully retreated from the gathering crowds. It seems the engineer on watch, who was well read in all technical matters, would not start the engine because the boiler fire was out and the fuel temperature was outside the parameters stated in the Doxford instruction book. I joined in Cardiff where she was carrying out a largly DIY refit with the excess of engineers the company had at the time. The Fourth Engineer Shaun Heffernan was most surprised to hear that I came from a small village in Yorkshire called Long Preston as one of the other 5th Engineers who joined with me Robert Stevenson was a neighbour of mine. Shaun came from Clithroe just a few miles down the road. The Yorkshire Dales was not renowned for its seafaring background. Joined Singapore while vessel was refitting alongside at Kepple Singapore following ER flooding in Vietnam. Lots of dockside trials and trips around Western Anchorage, with tug loosely hooked up at the bow for safety. Returned to Vietnam for a few trips, before heading for discharge in Japan. Lifted bunkers in Japan, including barrels of diesel oil on deck and in forehold, enough to see us Great Circle across the Pacific to Acajutla, Cutoco, Panama Canal and Curacao. Amastra had an Brown gyroscope that pumped up and down. Mercury rings on the piston had to be topped up regularly. Offsigned at Curacao, five days in Avilla Beach Hotel, and flew to Azores for refuelling then to Gatwick on a four prop constellation. My first spell sailing was as Third Engineer 2 months in 1962 when I transfered to the Amoria. I returned as Second Engineer March to December 1963. Yet again November 1980 to March 1981. Sailed on her 1st trip fiver in 1979, the chief was Don Joughin. Sailed on her again a few years later. Remember female deck cadets Tyson & McCune, Rab Birdi, Chief Atkinson, Steve Thomas, Dave Conway and many more. Good times! I spent 4 months or so on Amastra as a deck cadet. As many will remember, she was powered by a Doxford motor - a sight to behold...when it was running. I lost count of the times we wallowed aound 'not under command' while the long-suffering engineers fixed the fuel pipes (or some other, less frequent point of failure) again. After dark, sparks would drift out of the funnel, which was quite interesting when we were fully loaded with aviation fuel! The master at the time was the great Jimmy Millar. He had an incredible capacity for Ballantyne's whisky: I often saw him down a Heineken beer glass full (presumably 330ml in modern money) before dinner and go back for more straight after eating! Despite this, he hardly ever appeared to be under the weather (though on the rare occasions he was, he could be very entertaining). We had a trip into the Baltic when it was iced over. We had to tie up a good 15 feet off the loading platform because of the solid blacks of ice between us and it. The next trip took us to Curacao (or was it Aruba?) where the ship was heeled over somehwere between 10 and 15 degrees so that the anti-fouling paint could be reapplied, first on one side and then, after a quick turn around, on the other. We spend four days, in total, living on a permanent fairly steep slope! I was always a sucker for the older ships and I loved Amastra to bits (as I did Opalia and, to a lesser extent, Drupa and Serenia). What a pity such vessels have gone forever. On the 11th April 1967 I found myself sailing along the coast of Vietnam bound for the port of Nha Trang. I was a crew member on board the Shell tanker MV Amastra. We were carrying a cargo of Jp4 fuel for the American air force. We had loaded this cargo in Singapore, while there the Bum Baot girls had come on board,along with an Indian Sikh, he was telling fortunes. He told me I would be going home soon, I had already been on board the Amastra for seven months.On this morning I went on deck at seven o'clock to watch the early morning mist clear from the mountains, a first glimpse of this country so much in the news for so many years of war. Mid day came and we finally reached our destination in the large bay at Nha Trang. We were to anchor and connect up to a submarine pipeline, where we could remain as a floating storage depot for the American air force. The idea being the fuel would be safer in a ship in the bay than in the storage tanks ashore where the Viet Cong could attack and destroy it. There would be no shore leave as we were in a war zone. That evening we had a film show on board, one of the three films we were allowed per month,so things were not so bad, a few cans of beer and a nearly new film, what more could we want.The film ended about ten thirty pm, I returned to my cabin to play with the dials of my brand new Phillips World receive radio,just bought in Singapore.It had been a long and soon I was in my bunk with lights out,but not for long. I was rudely awakened by a dull thud and vibration in my cabin,quickly followed by the ships alarm bells being sounded.I was out of my bunk as quick as a cat chased up a tree by a bull dog,on with shoes and trousers, and one other very important thing my Lifejacket, for I could not swim an inch.I was met in the alleyway by my ship mate John Young from Longford and the third engineer shouting,get out quick she's going down.We dashed along the alleyway and up the companionway to the deck where we found the crew messman cowering down behind the ships steel bulwark.I asked him what had happened ,he replied we might have been fired on from ashore,he didn't know for sure. Within an few more moments the lights went out and the ships horn sounded the abandon ship signal. My lifebaot station was midships on the port side, which meant I now had to make my way along the catwalk above the tanks of jet fuel oil to reach my boat station, where my job was to tie the painter from the lifeboat to a bollard on the fore deck. I have often heard of the experession of a person's knees knocking together,now I was experiencing it for myself first hand as I made my way along the deck after securing the painter.My lifeboat had now been swung out over the ships side by the other crew members, when along came the marines to rescue us. Small patrol boats and amphicars were sent from shore when the lights went out , and our distress call was picked up.By now we could see and feel the ship sinking by the stern.The Viet Cong had sent out an under water swimmer to plant a limpet which blew a large hole in the engineroom. As no one knew how many had been planted , we were told to stop lowering our own lifeboats and get in the rescue boats as quick as possible,because if there was another explosion we were all dead men. 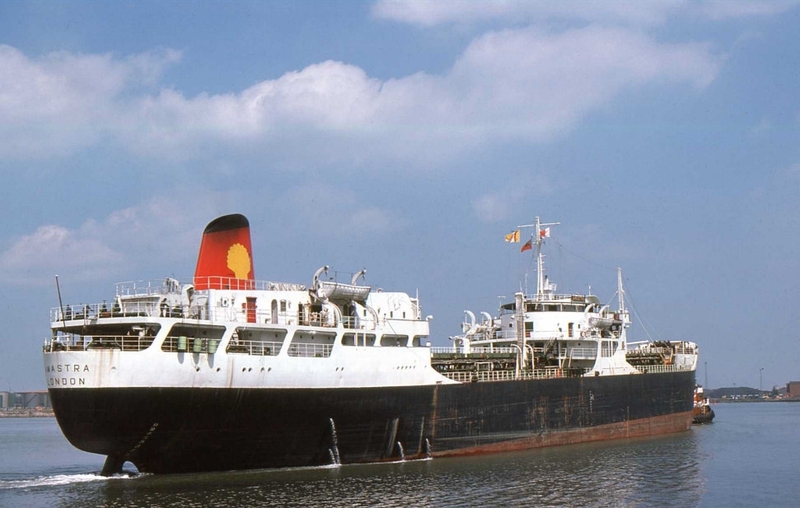 At 0010h, on April 12, 1967, the privately chartered 9,000 ton British flagged Shell Oil tanker M/V AMASTRA had been holed by an external explosive device while moored in the POL transfer anchorage in Nha Trang Harbor, Vietnam. The AMASTRA was preparing to off load aviation fuel for military aircraft when the explosion ripped open a four by six foot jagged hole at the waterline near the fire wall between the engine room and the boiler room. The engine room, fire room and the after pump room flooded in twenty minutes causing the AMASTRA?s stern to settle to the harbor bottom leaving the rear decks awash. Another Shell Oil tanker, the Dutch flagged M/V KARA from ?s-Gravenhage, Netherlands arrived and moored port side to the AMASTRA. The KARA provided auxiliary power and steam so AMASTRA could transfer 640,000 gallons of fuel to the KARA. The AMASTRA's damaged area was thirty feet below the water line and required a twelve by twelve-foot patch. In the early morning hours of April 13, USS ?Current? ARS-22 arrived at Nha Trang. Shortly after arriving, the work boat was placed in the water and a salvage team departed for the tanker to survey the damage and plan a course of action. Commander Service Group Three salvage officer Commander J. B. Orem was designated Officer in Charge of the AMASTRA salvage operation. USS ?Greenlet? ASR-10 as well as Harbor Clearance Unit One's HCT-3 staff members were also sent from Vung Tau to assist during the re-floating operation. Floodlights were secured on USS ?Current? ARS-22?s rails and directed into the waters around the ship at sunset. Armed sentries were posted during darkness to defend against any attempt to attach an explosives charge to USS ?Current? ARS-22's hull. Early each morning, USS ?Current? ARS-22 weighed anchor and moored starboard side to AMASTRA. At the end of each day, USS ?Current? ARS-22 departed AMASTRA and re-anchored in the center of Nha Trang Harbor for security. Prior to transferring fuel oil to the KARA, USS ?Current? ARS-22 diver LTJG Vince Weis along with a HCU-1 diver wearing shallow water diving gear went into the AMASTRA's engine room, filled with dangerous gas fumes, to close a set of valves that allowed AMASTRA's oil cargo to be transferred to the KARA. USS ?Current? ARS-22?s crew rigged salvage pumps and compressors then transferred them to the decks of AMASTRA. After the ship?s divers maneuvered a fabricated patch into place to stop the inflow of sea water into the engine room, the salvage pumps were started and the AMASTRA began to show freeboard. The spaces on the AMASTRA that had been flooded were cleared with the help of thirty to forty Vietnamese and Filipino stevedores. With the loss of power for refrigeration, combined with the hot climate of Vietnam, an estimated six thousand pounds of spoiled meat and vegetables were removed from AMASTRA to a barge then dumped at sea. While ashore hiring the stevedores, USS ?Current? ARS-22?s Operations Officer LTJG Mark Lusink in a conversation with local villagers was informed that the AMASTRA was mined by the South Vietnamese to prevent it from sailing to Haiphong, North Vietnam. 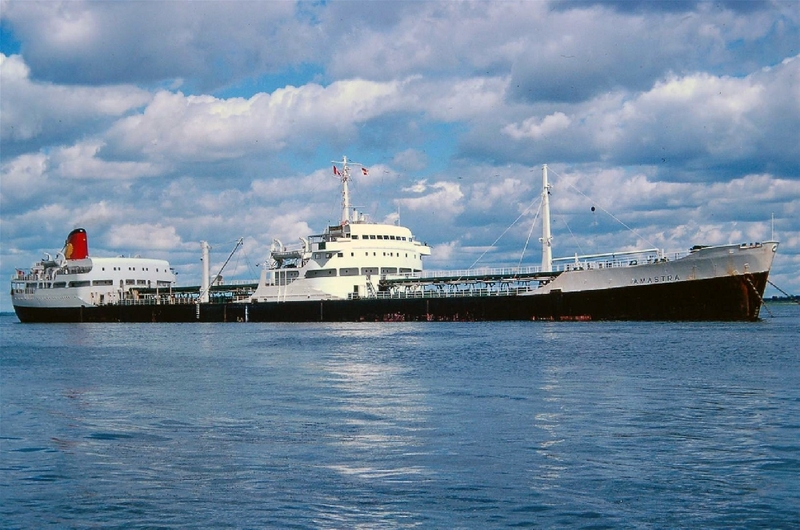 Shell Oil tankers did not travel to North Vietnam. The initial investigation indicated that a Limpet mine of approximately 80 to 90 pounds of explosives was used. In view of the close proximity of 150 yards to the beach hamlet of Truong Tay, a known haven for local pilferers, black marketers and other questionable individuals, the investigation determined that the explosive charge was most likely delivered from the hamlet area by a swimmer sapper. The Vietnam war was certainly a strange and crazy war. The majority of the 43 man crew was removed by local Army landing craft about half an hour after the explosion. They spent the night at the American Army Officers' quarters at Camp John McDermott in Nha Trang. On April 22, 1967, USS ?Current? ARS-22?s salvage crew successfully raised and dewatered the AMASTRA. The fabricated patch was removed and a more permanent steel patch was constructed. SFM2 "Ace" Acfalle, one of USS ?Current? ARS-22's ship fitters, spent the better part of two days, without any rest, welding the metal patch to the AMASTRA to make it seaworthy. 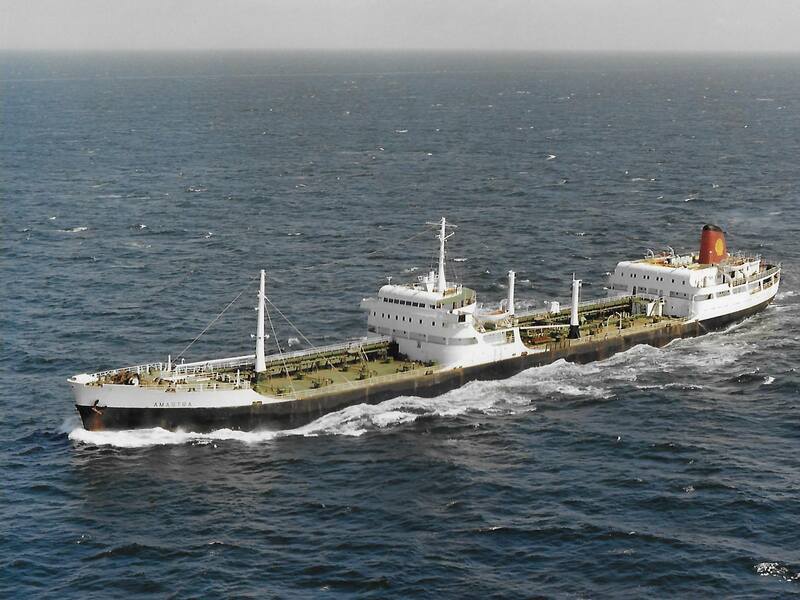 The AMASTRA was towed by commercial tug to Singapore for dry-docking and repairs. Have you sailed on Amastra (2)? Log in and add yourself as a sailor to the Amastra (2)! Log in and add your personal story to the Amastra (2)!